A 17-year- old school boy, Gautam Kaushal, got a first-hand account of the Haryana police after he fell out and quarrelled with the son of a cop. An inter-state gang of car thieves allegedly involved in stealing cars from the city with duplicate keys, prepared in alleged connivance with a supervisor working in Hind Motors, was today busted by a team of the crime branch of the Chandigarh police. The Rs 1.06-Crore project of the Public Health Department to provide an alternative storm-water drainage system in Phase V here was put to test during the incessant rain that lashed the town last night. The project seems to have fallen flat on its face as rain water entered many houses in the area. India is fast replacing China to emerge as a major destination for doctors from the USA, Canada, the Philippines, Ghana and other countries, to get trained to conduct no-scalpel vasectomy surgeries. And most of the doctors from abroad are coming to the Urban Family Welfare Centre at Amritsar. The Government of India has decided to transfer the administrative control of Mohali based Semi Conductors Limited from the Department of Information Technology to the Department of Space. A protest march was organised by Sikh organisations today against the “illegal” arrest of Sector 34 resident Manjot Kaur by the Fatehgarh Sahib police. 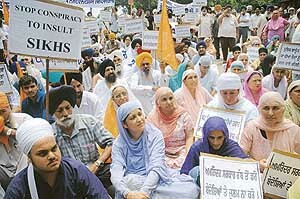 Carrying placards and banners against the alleged state repression, scores of protesters marched in procession from the Sector 34 gurdwara to the Sector 34 police station. The CPM, which has been critical about what it describes as India’s “tilt” towards the US, has many more questions to ask from the Prime Minister, Dr Manmohan Singh, about his recent official visit to that country. 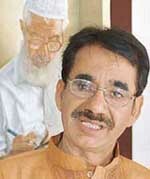 Stiff opposition from within the Congress notwithstanding, a former Chandigarh Vikas Manch activist turned-Congress leader, Mr Devinder Babla, has found a place in the Territorial Congress Committee, the highest policy-making body at the local level. Employees of the Chandigarh Administration have moved the Principal Bench of the Central Administrative Tribunal, Delhi, seeking transfer of their cases to another bench. Terming the recent Supreme Court judgement in the Gill-Bajaj case as a “landmark” one, the then counsel for a senior IAS officer, Ms Rupan Deol Bajaj, today hoped that it would act as deterrent in the sexual harassment cases at work places. The Army is handing over its Vijayanta tanks, which have been withdrawn from active service with armoured and mechanised formations, to infantry units for beefing up their firepower. 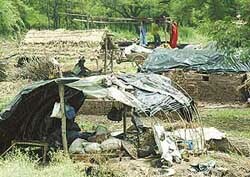 Inducted in 1967, the 1,000-odd Vijayantas are in the process of being phased out from service and decommisioning is expected to be completed by 2007. Residents of Jaspur, Kakrali, Toda and Natwal villages today held a mahapanchayat to work out a strategy to deal with the fly menace, which has led to the spread of cholera in the region. The Shiromani Akali Dal has convened organisational meetings of all sections of the party at Kalgidhar Nivas here on August 13 and 14. The Political Affairs Committee (PAC) of the dal will meet on August 14, Dr Daljit Singh Cheema, secretary of the party, announced today. Showers left a devastating impact on city roads. 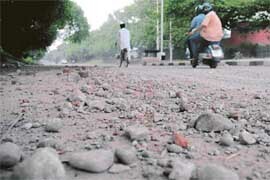 This picture was taken by Tribune lensman Pradeep Tewari on the Sector 18-19 dividing road, Chandigarh, on Sunday. There has been an increase in the number of cases in which investigating agencies are seeking opinion of scientists at the Directorate of Government Examiner of Questioned Documents here to testify the authenticity of handwriting on suicide notes on walls. A 30-year-old woman died this morning of electrocution at her Chaman Colony residence in Dhanas village here. A month after the enforcement wing of the Haryana Urban Development Authority had cleared encroachments in Sector 21, the encroachments are back with a bang. The local unit of the All-India Anti-Terrorist Front today remembered Shaheed Udham Singh on his martyrdom day. At least five to 10 houses in Balmiki Colony near Sohana caved in following incessant rain last night. Another 10 houses were damaged. The residents had to spend the night in the open. Thieves reportedly decamped with gold ornaments and electronic appliances from two houses in the city. The police arrested three persons for assaulting and threatening and another one for allegedly trespassing into a house. non-fiction. These were the views expressed by Ravi Singh, Executive Editor, Penguin India, in an interview here today. Ravi was visiting the city this weekend to make contact with a few writers who are working on commissioned books. A leading cultural organisation Yaadgar-e-Rafi Society paid tributes to versatile singer Mohammed Rafi at a grand musical evening, today at the Tagore Theatre on his 25th death anniversary. Litterateurs of the city paid tributes to the legendary author Munshi Prem Chand on his 125th birth anniversary at a largely attended seminar on the DAV College campus yesterday. From Pakistan to Panchkula, Saeed Ahmad Anjam’s journey has been one of fascination and realisation. Back in his nondescript hometown of Mailsi in Multan, Anjam could have barely imagined the intensity of Indian charms which hold enough inspiration for every artist in the world. Meher Mittal, the king of Punjabi comedy, is at it again. After a break of three years, the favourite character actor of Punjabi cinema is back to play the lead role in a new video film called “Lungi Bau”. To be shot in September, the film is being created for markets across the globe, especially in England, Belgium, France and England. It is making lifelong friends, of gathering strength from one another, of being courageous and proud. It is the story of hope, compassion and audacity, in the face of adversity, the story that each cancer support group in the city epitomises. 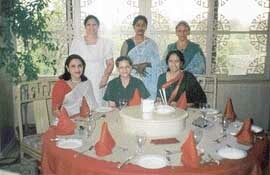 A file photo of the first meeting of the Sahayta Cancer Survivors’ Club in the summer of 2003. In a relatively rare surgical achievement, a 95-year-old resident of Ambala was implanted with a new hip at a private hospital in Mohali. The patient, Vidyawanti, had fractured her left hip joint following a fall at home about two weeks ago. A cycle rally was organised by the Chandigarh Healthy Heart Project, in collaboration with Sri Guru Harkrishan Model School, Sector 38, and the Chandigarh Amateur Cycling Association here today. Fortis Hospital here today organised a daylong free “women’s wellbeing” camp at the Fortis City Centre, Sector 9, Chandigarh. Over 80 persons attended the camp. Stars are only beginning to shine on two local hockey players - Rajpal Singh and Jaswinder Singh - who have been included in the Indian hockey team. Students of DAV School, Surajpur, were declared overall champions as they won maximum number of medals in the second Kalpana Chawla Memorial Karate Championship, 2005, held at Jainendra Public School, here today. Manisha Sharma of Patiala defeated Nadia Saini of New Public School in the women’s category (11-6, 11-4, 9-11, 6-11, 8-11, 11-9) on the final day of the DAV Public School Open Table Tennis Tournament held at Table Tennis Hall, Sector 23, here today. 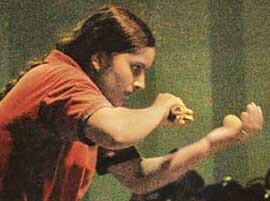 Manisha Sharma of Patiala on her way to winning the women final match during DAV open TT tournament at Sector 23, Chandigarh, on Sunday. Satluj Public School, Sector 4, has emerged as one of the Centres of sporting excellence in Panchkula. 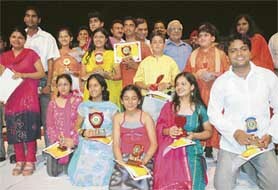 The school has been the hub of national-level players in various sports like roller skating, tennis, draughts and cricket. Naveen Bansal, with unbeaten seven points, emerged winner in the 16th Chandigarh Chess Championship that concluded here today at Jawahar Navodya Vidyalaya, Sector 25.